Login as an admin if you’re not already. Either go to the Dynamics 365 Home page, or one of your Unified Interface apps. Click the gear icon at the top and near the right-hand side of the interface. 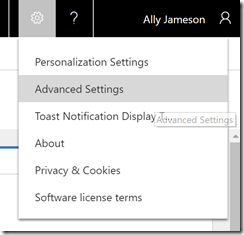 You’ll find yourself in the old familiar Settings area of Dynamics 365. How Should I Configure Dynamics 365? Unified Interface Apps: For example, if you log into Dynamics 365 for Sales, at the bottom-left of the screen you can switch to the App Settings area. From here you can configure some settings. PowerApps: Eventually all of the configuration for Dynamics 365 (fields, forms, views, charts, dashboards, workflows, etc) will be available from PowerApps. Today many of them are there, and I’m guessing we’re 6-12 months from all of them being there. Office 365 Portal: To add some modules, you will need to navigate to the Office 365 portal (portal.office.com) and then to the Admin Centers area, and finally to the Dynamics 365 Admin Center. AppSource: Some apps are available only via Microsoft AppSource. Is Dynamics 365 Configuration Going to Become More Confusing? I certainly hope not. But Dynamics 365 has grown to become a very large and complex set of applications, so configuring them will continue to evolve. My guess is that settings (things like user preferences, global settings, etc) will become available within the Unified Interface Apps. And that most customization settings (form layout, processes, etc) will move to PowerApps. That leaves some gaps (such as Users, Security Roles, Outlook Integration, etc) that seem to me like they should be within easy reach of an administrator with out having to leave Dynamics 365. We will have to see how Microsoft makes these settings easy to work with.